The mission of the St. George Housing Authority is to assist low-income families with safe, decent and affordable housing opportunities as they strive to achieve self-sufficiency and improve the quality of their lives. The Housing Authority is committed to operating in an efficient, ethical and professional manner. We will also partner with our residents and others to enhance the quality of life in our communities. Dixie Sun Manor is a senior complex owned and managed by the St. George Housing Authority. Dixie Sun Manor is a 30 unit complex. Residents pay approximately 30% of their gross adjusted income toward rent and utilities. 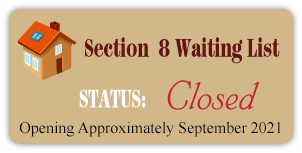 The waiting list is currently open but the expected wait time is unknown. St. George Housing Authority (SGHA) currently administers 244 vouchers which allow participants to locate a unit of their choice within the Washington County area. Tenants pay approximately 30% of their adjusted gross income toward rent and utilities and SGHA pays the remainder. Applicants must successfully pass a criminal background check and have favorable landlord references. To be eligible, applicants must not have a history of drug related, violent or sexual related offenses.